Welcome to another Monday, Buffalo Stamps and Stuff Challenge. Today's challenge is a toilet tissue roll mini book. Yep, you read that right, a flattened toilet tissue roll makes a perfect pocket for a mini book page, and will hold a tag. Just flatten three rolls, (or as many pages as you want to make) use a bone folder to get a good crease. Because they can be different sizes, trim them so they are all the same length. I then just covered both sides of each flattened roll with coordinating designer papers (Graphic 45 and Basic Gray). 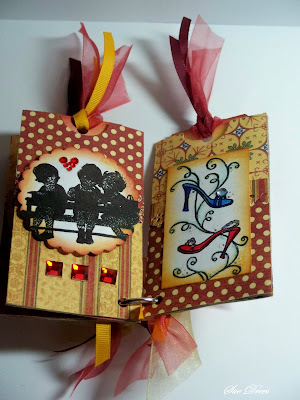 I then decorated each "page" on both sides with stamps and embellishments. Each roll holds a tag cut just slightly shorter and narrower than the measurement of the roll. 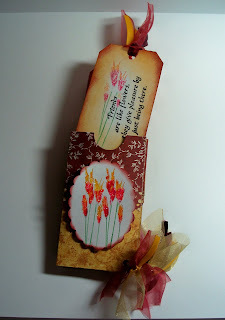 I stamped and decorated each tag on both sides to go with the page it was tucked into. When I had completed all the pages, I joined them with a ring at the lower left side. Decorated the tags and the ring with coordinating ribbons. I also punched a thumbhole opening in each pocket, which is optional. You can make the pages up and down as I did or sideways like a book. There are a lot of You Tube tutorials on this, just google toilet paper roll book. Everyone does them just a little different. When I covered them, I just cut the paper to fit the one side of the tube and then turned it over and did the same on the other side. Some folks wrapped the paper all the way around. 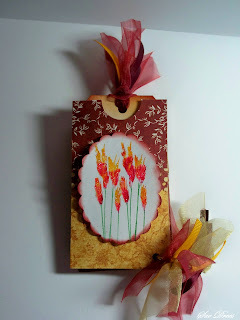 I used white craft glue to adhere the designer paper. These little books make nice gifts. I made this one "Friend Themed". Kids would love to have one of these all about them. I have to thank my stampin buddy, Cathy, in Glendale Arizona, for sending me one of these little books and giving me the idea for this one. Thanks Cathy for all the wonderful, creative cards, ideas, and gifts you send my way...xoxo. Hope you have a chance to make a toilet tissue roll mini book. I had never seen a toilet paper roll book before. This is fabulous! 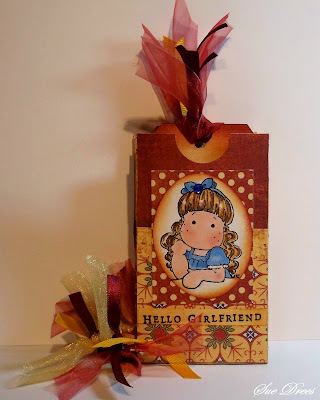 Love this idea...now I've got to start saving the rolls! So beautiful Sue,i love the image. Love it! I already have the rolls saved and ready to make my first one. Thanks for the inspiration. Now, how cool is that!! I just don't know how DH will react when I tell him to save the toilet paper rolls for me. LOL! This is the ultimate in recycling, looks great, love the idea, it would be the perfect size for say, including a recipe on a holiday cake recipe or something, hmmmmmm, you got my brain spinnin' here, thanks Sue!! You and Cathy are quite a pair! 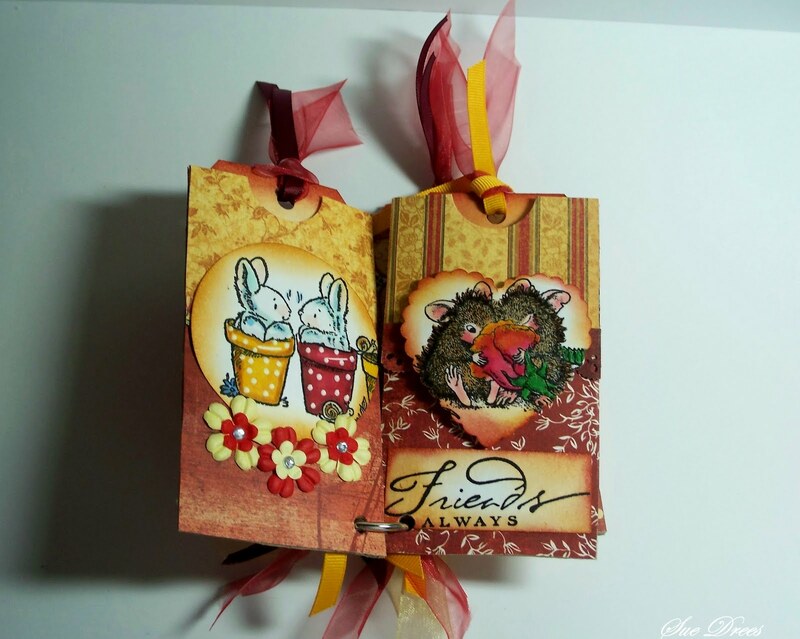 What fun it is to have "card pals". This is so clever -- and yet another "something I didn't know about" -- you teach me something new everytime I come by.